This product has a price of $48.00. It is 100% handmade. You can customize it as well. This product comes with beautiful looking sheep horn and a great pattern. Those customers who have purchased this product, they are extremely satisfied with it. Free and fast shipping is available. 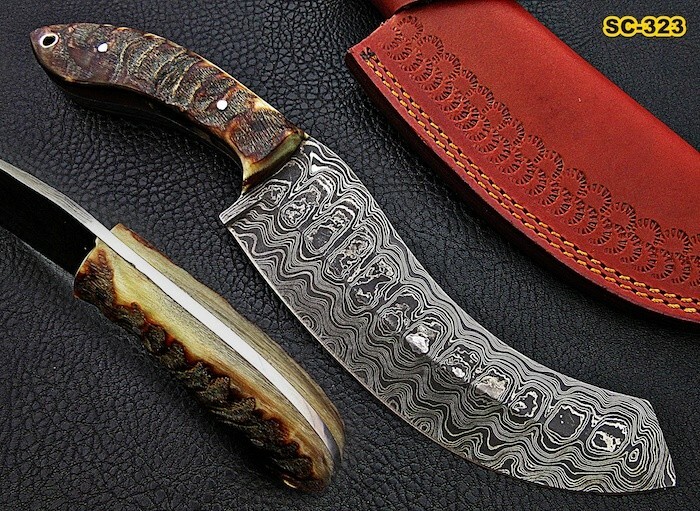 The overall length of this knife is 11 inches, it has 6.5 inches in length Damascus steel blade and its ladder has been patterned with a full tang blade. Its sheep horn handle is of 4.5 inches. This particular product has a price of $65.00 . This knife handle is purely and 100% handmade. It comprises of a D2 steel and a mosaic pin. Free, fast shipping is right there available at their end. 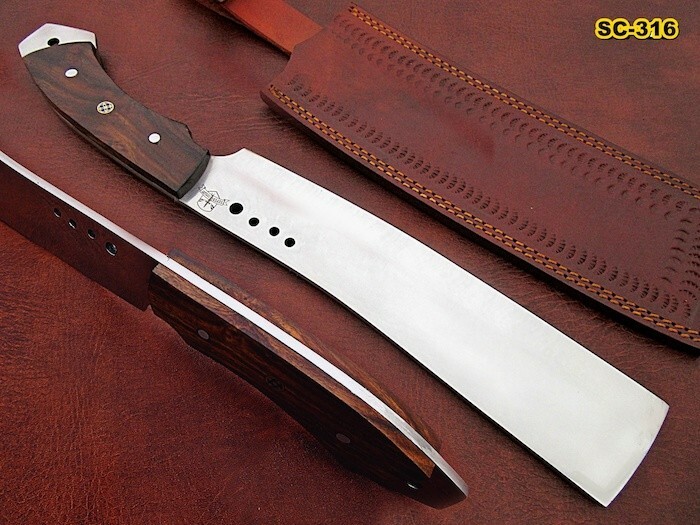 Note down that 15 inches is the overall length of this subjected knife and its D2 steel blade is 9 inches in length. 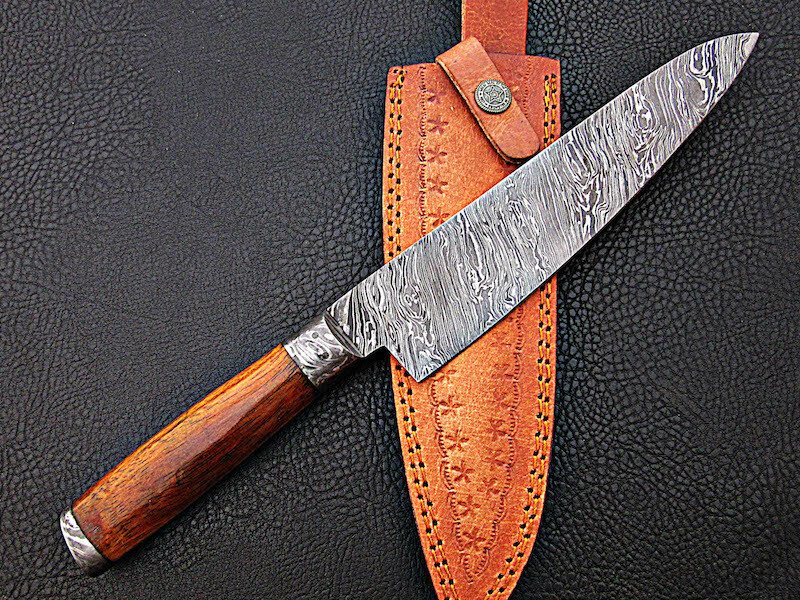 Its rosewood and mosaic handle is 6 inches. Next one product is $45.00. 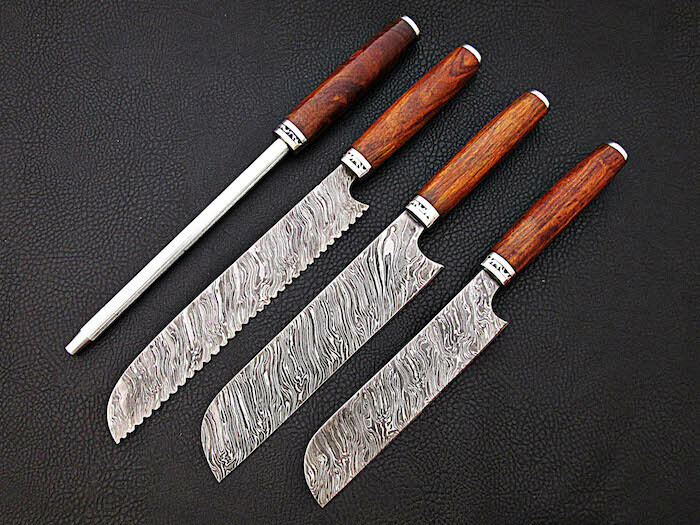 This chef knife that comes with a rosewood handle, it is made with a unique design. 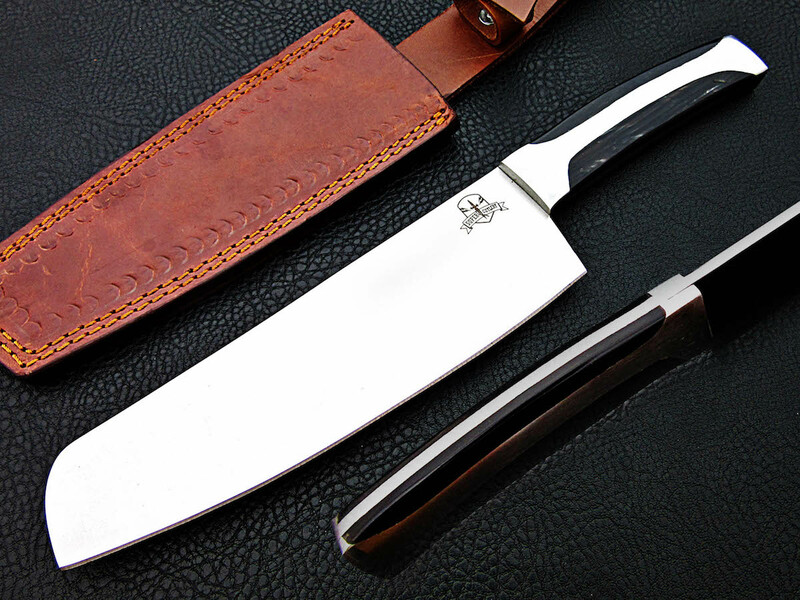 Its blade length is 8.2 inches and this knife handle length is 5 inches. This product comes in a twisted pattern and its hardness level is about 55 to 60. Its sheath is made of genuine in form cow leather. Next one product has the price of $28.00. It has a leather sheath and great customer satisfaction reviews are being received by this product. You will get a free shipping if you have decided to buy this product. 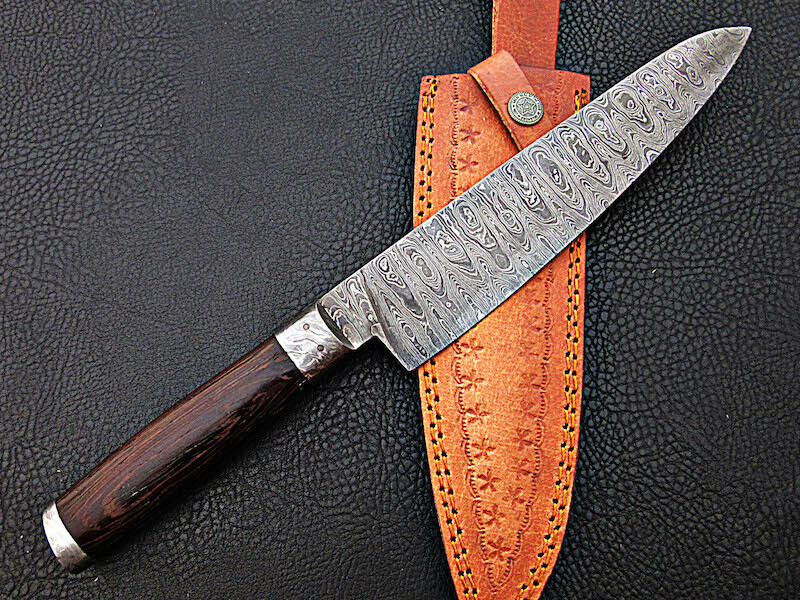 This Custom Handmade Damascus Chopper Rose Wood Handle blade length is 2 x 5 inches and its handle length is exactly 1.8 x 3.5 inches. We know that D2 Steel is a rust-resistant kind of steel that is why this product will be able to retain for a much longer time. This subjected product has a total price of $45.00. This product is right now in stock. You will be offered a free shipping on buying this product. 6.5 inches is its blade length and 5 inches is its handle length. 55 to 60 is its hardness level and its sheath is purely made of a cow leather. This next product has $58.00 price. 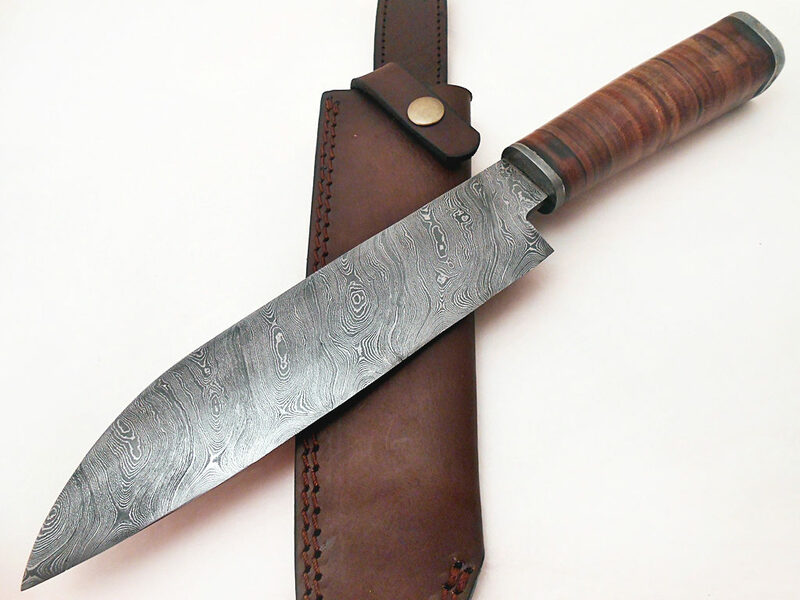 Its Damascus steel blade length is 13.8 inches and 9 inches long steel blade, this blade is in the twisted pattern. Its leather handle is 4.8 inches. Its sheath comes with this cow leather material and this sheath as well comes with a secure and front fastened belt loop. This product has an exact price of $45.00. This product blade length is 8.2 inches and notes that 5 inches are its handle length. Damascus steel is used in its manufacturing process. and the pattern is completely and wholly twisted. Its hardness figures are 55 to 60. We have next one product review for you and this product has a price of $ 85.00. It is handmade and customized designs are available in this category. It has a buffalo handle. 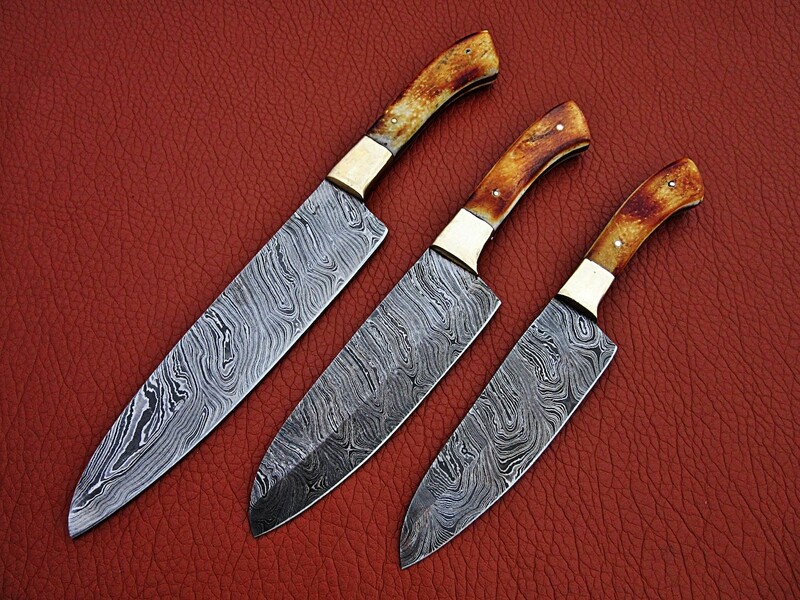 Its full tang blades are available in lengths 7 inches, 7.3 inches, 6.2 inches. It is because of its full tang blades that you shall see a fuller and complete strength in these knives. This knife can mainly be used as a chef knife but you can use it for routine tasks as well. It has a price of $125.00. This product patterned steel blades are mainly available in 8.5 inches, 6 inches, and 5.5 inches in lengths. Its handles are either of 5 inches, 4.5 inches or 4 inches in their lengths. 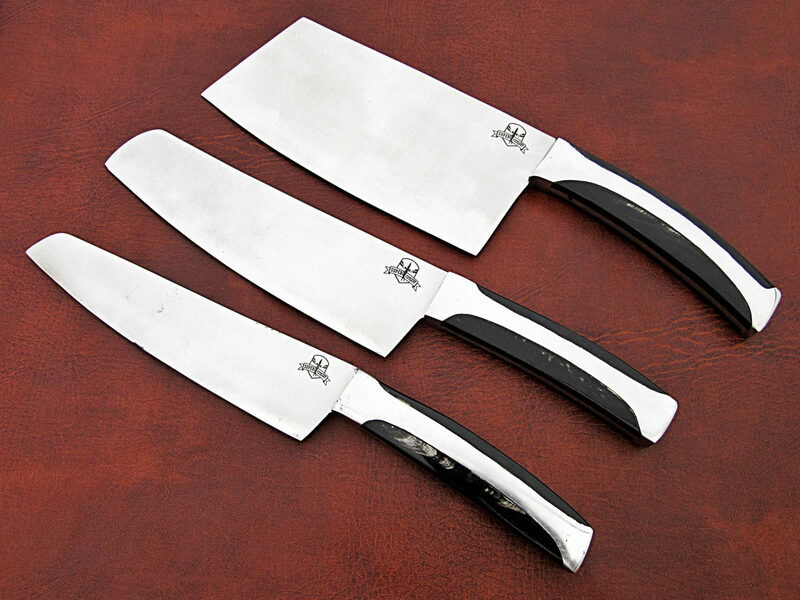 Use these knives freely as chef knives or as everyday knives. Its blades are being heat treated so that maximum hardness can be attained. The last product we have for you and its price is $120.00. 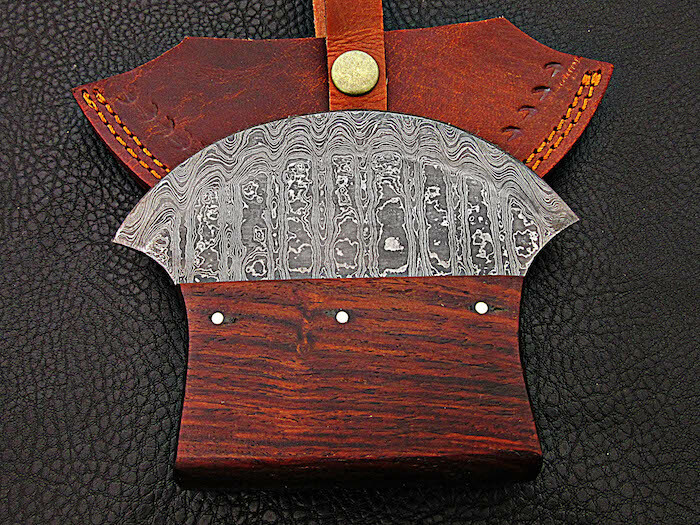 It is a 4 piece set and leather sheath is included as well. Its blade lengths are of 7, 8 inches and 8, 9 inches. Its handle lengths are of 5, 5, 5, 5 inches each.